When the heat is on, cool down with this light, fruity and refreshing mock-a-rita. 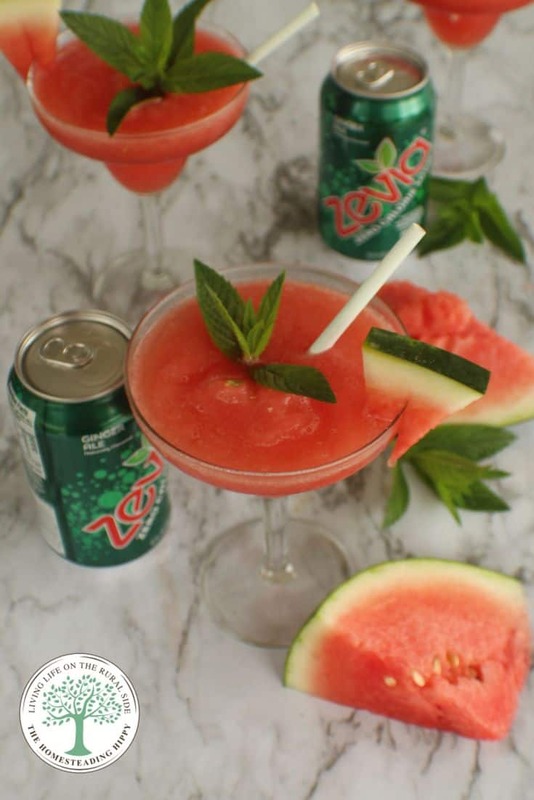 With juicy watermelon and zippy mint, you’ll recharge, refresh, and rehydrate without added sugars you don’t want! True story here. An admission of my foolishness back in the day. I first discovered produce auctions in our area a few years ago. What’s a produce auction, you ask? It’s a place that local farmers all gather to sell their produce, such as green beans, apples, flowers and the like in bulk quantities. You bid on a flatbed of a certain type, and the winner gets to purchase the entire lot for themselves. It was a great way to supplement our garden produce at one time, since our garden beds were not very fertile the first few years we lived here. However, there were lessons to be learned, too. See more about going to produce auctions here. Never bid on something you don’t want. Really, if you don’t want to purchase 10 bushels of apples, don’t bid on it. Once you are the winner, you are required to pay for those apples, whether or not you meant to do it. A bid can be made just by waving your hand, saying a price, or nodding your head. A bid can also be made by moving your hair at the wrong time, as the auctioneer may think you are purposely waving your hand. “I didn’t realize” is not a valid argument to NOT purchasing your winning bed of produce. 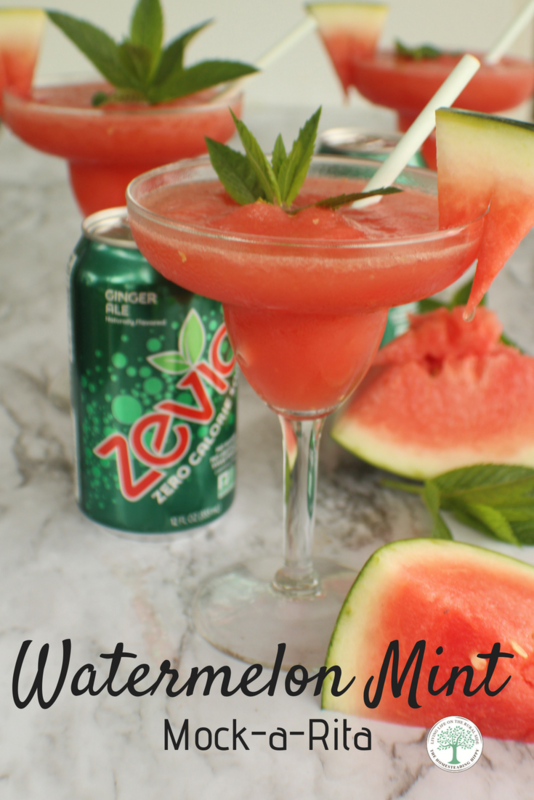 What do those lessons have to do with this watermelon mint mock-a-rita? Plenty. The first time I went to the produce auction, I didn’t know all the above rules. When the time came to bid on watermelons, there was a lot of 27 of them. It was a windy day, and my hair got in my eyes. Can you see where this is going? The good news is that I won the bid of 27 watermelons for only $.75 each. The bad news was that I had to figure out what to do with them once I got them home. There was only so much fresh watermelon my family could eat before they went bad, and my neighbors did NOT want more than 1 each. No matter how much I begged them to take 2 or 3. So, I decided to freeze some of them. cut the pieces up into 1 inch chunks. place in either plastic bags or freezer containers. Remove as much air as you can before storing in the freezer for up to 6 months. Longer than that, and it can begin to crystallize and the flavor may be “off”. 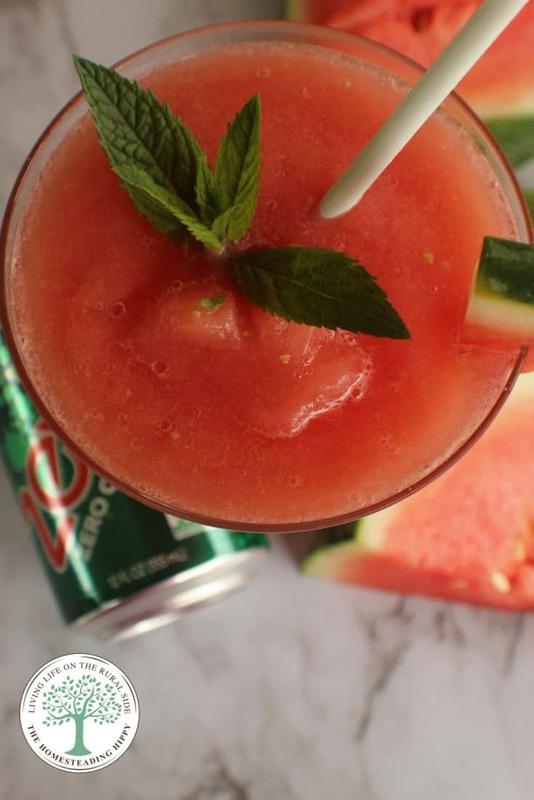 Frozen watermelon is perfect for smoothies, granitias, and for making these yummy mock-a-ritas. To be fair, I used the full sugary-corn syrupy, garbagy soda the first time I made these. I know better now to avoid that stuff. Sugar is no bueno for me, and I choose not to give it to my family, as much as we can avoid it. To see more about sugars and why they aren’t healthy, read the post here. Cut the watermelon into 1 inch chunks. Freeze at least 4 hours, or overnight until solid frozen. Add 3 cups frozen pieces to high powered blender. If you REALLY wanted to, you could add a shot or two of rum or tequilla to make watermelon margaritas. You can easily make a large batch for a group setting, simply store in the fridge until ready to use. Simply reblend as necessary to get desired consistency. Are you ready to make these mock-a-ritas? Be sure to pin this for later, too! Please tell me – How Much Watermelon are You To Put Into The Mockaritas? 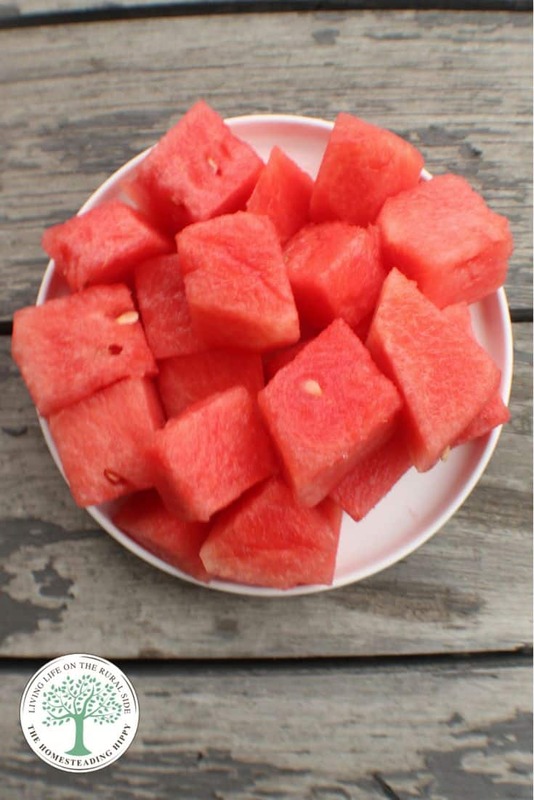 All you say is to cut the Watermelon into 1 inch cubes and then freeze those for 4 hours or until frozen solid. You never say How Much, so How Much? 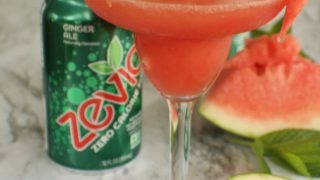 I want to make these but not only do I have the worst luck picking out sweet watermelon (it’s usually has lots of moisture but the flavor is lacking) the flavor is lost, so once I find the right watermelon I will be eating it and freezing the rest (which I already knew it could be frozen), to use in recipes. But I like to know how much I’ll need so I can leave the rest in the freezer.